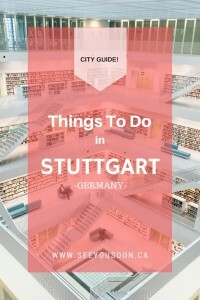 Looking for things to do in Stuttgart, Germany? Watch the video above or read below to get the most out of your visit to the city! The first thing you’ll want to do is pick up a Stuttcard. These cards give you access to the public transportation system, entrance to all museums, and discounts on a number of attractions in Stuttgart. They’re available for 24, 48, or 72 hours with prices starting at 17 euros. They are a great value if you’ll be spending a few days in the city. You can pick up a Stuttcard from a variety of spots including the tourist information booth at the Stuttgart Airport (terminal 3, level2) and the “i-Punkt” tourism office on Königstr. Across from the main plaza, the Schlossplatz, is the New Palace, an 18th century Baroque-style building and the last city palace to be built in Southern Germany. This is where the Kings and Queens of the Baden-Württemberg region lived until the monarchy ended. In 1918, the New Palace fell into the State’s ownership after King Wilhelm II abdicated the throne. It was almost completely burned to the ground during WWII, with only the front façade remaining, and was reconstructed in the 1950s. The State government still owns the New Palace and it is here where you’ll find some of their offices. The Old Palace dates back to the 14th century and is where the Dukes and Counts of the Baden-Württemberg region called home before they moved to the Ludwigsburg Residential Palace. Today it is now the Württemberg State Museum and showcases the history of the region from the Stone Age to present day. Here you’ll find a collection of national antiques, including instruments and glassware. Just off of the Schlossplatz is the Kunstmuseum, Stuttgart’s modern and contemporary art museum. It opened in this located in 2005 and showcases art for the municipal’s collection of 15,000 pieces of work. Each year the Kunstmuseum displays two to three special exhibitions along with the rotating municipal collection. Bonus tip: head up to the 5th floor and get an impressive view of the Schlossplatz below. If you’re a car enthusiast you’ll be excited to visit the Mercedes-Benz Museum. Both Porsche and Mercedes-Benz were founded in Stuttgart and both companies still have their head offices in the city. At the Mercedes-Benz Museum, you can learn about the invention of the automobile, the history of the brand (and how it got its name), and how it has evolved over the last century. Over 160 vehicles, including some of the first vehicles ever built to plans for the future, are showcased across 16,500 square-feet of space in an architecturally stunning building. Wrap up your time at the Mercedes-Benz Museum with a meal at the Restaurant. I highly recommend the Swabian Maultaschen, a large ravioli-like stuffed pasta originating in the region. In stark contrast to the historic architecture of the downtown city core, are a number of modern developments happening around the city. One of those is the newest Stadtbibliothek, the public library, located in Mailänder Platz. It was built in 2011 and designed by Korean architect Eun Young Yi. By day, it looks like a plain grey, cubed building. But at night the building glows in blue hues. The interior is where the building and architecture really shines. The library also boast one of the most advanced sorting systems in Europe which can be viewed through glass walls on the main floor. Do you enjoy exploring a city through your stomach? Then you won’t want to miss a visit to the Markthalle. It has been operating for over 100 years and offers regional and international products, including fresh fruits and vegetables, meats and cheeses, delectably-looking sweet treats, and home and garden decor. Watch all the action from the upper level while enjoying an espresso or latte. Have any more recommendations for things to do in Stuttgart? Leave them in the comments below! Special thanks to The German National Tourism Office and Stuttgart Tourism for supporting my visit to the city.